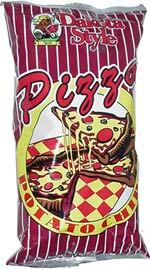 Taste test: These are thick and crunchy chips that sort of taste like pizza. It's rare than any pizza-flavored chip truly tastes like you're eating a slice of pizza, and these are no exception  the taste has some of the same spices as pizza, but it really doesn't taste like pizza. Not the crispest kettle-style chip in the world (Cape Cod beats Dakota in the crispness category), but a good, crunchy, tasty chip nonetheless. Smell test: Smells kind of like pizza, with basil dominating on the first whiff, with then some noticeable cheese and tomato thereafter.